YNaija has a special focus on politics and is committed to providing a platform for younger politicians to reach mass youth audiences. 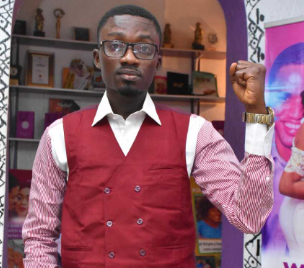 As we lead up to the 2019 elections, we are profiling politicians who are taking advantage of the Not Too Young To Run Bill. 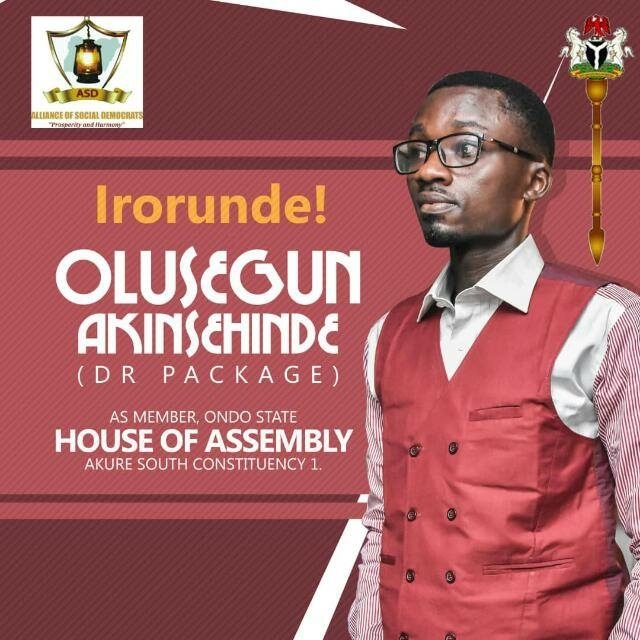 And so, the YNaija series – YNaija Politico – introduces Olusegun Akinsehinde, a 31-year-old also known as Dr Package, and a candidate of Alliance of Social Democrats (ASD). Was running in the coming elections your idea or someone else’s? Or the Not Too Young To Run Bill encouraged you? It was the idea of my people. As much as I have been nursing this ambition for long but my people prevailed on me to represent them at the level of the State House of Assembly -Ondo State House of Assembly. My purpose of running is to offer alternative leadership and return power to my people, where people’s based legislation will be enacted for the development of our people. No one is most qualified for this but I’m pretty sure I have what it takes to represent my people, that’s why my good people have called on me to take up this task and give them in return good legislation. If you don’t run in the coming (or any future) elections, do you think the public would lose a valuable, knowledgeable political leader? Just like I have said, my purpose for running for office is changing the narrative and ultimately offer alternative leadership, hence my people won’t only lose a knowledgeable or valuable person but it will cut off the chances of youth taking positions of leadership. Everyone running for different offices in a way is knowledgeable in their right and have the right to contest. The so-called godfathers attain whichever status they acquire because they were able to build people and structures around them. Without structures, no godfatherism. It is structure first. Before now, how have you reached out to people in the grassroots in terms of improving their lives? Sure, I have been in connection with my people. Some years ago I was in my primary school in my village where I donated books and other educational materials for the pupils. Have never too far from my people. Why do you think there is a low representation of young people in political offices? It’s simply…financial war chest. Many Nigerian youth who have passion for the development of the people have no job let alone gathering financial muscle to spin the political-financial wheel. But, we are changing that narrative. Youth participation in politics and policy making is low. But this is borne out of sheer ignorance. Many of our youth leave decision making in the hands of our old barrages. This must change. Come up with people-based legislation and give power to the people. Social security bill will be part of what we will put forward at the Parliament for our youths and aged men and women. Live continues. And I will not stop engaging my people until good life is guaranteed. I will work with whoever wins the election to ensure good governance that will guarantee better lives for our people. The fact is nothing good come easily. The youth must not atop to advocate for good governance and social security for our people. No success comes without stress. We must not stop at this level, the bigger picture should be the focus and the encouragement. We have had, in this YNaija Politico series, Omobolaji Ladigbolu, candidate, House of Assembly (Iseyin/Itesiwaju, Oyo) and; Kayode Oyemakinde, aspirant, House of Assembly (Lagos).